Firefighters across California have been put through a lot this summer: days-long shifts, weeks away from home and six firefighter deaths. People tend to think of firefighters as calm under pressure, stoic about the risks they take and private about the devastation they witness. Many firefighters prefer to maintain that image. But as fire seasons intensify, more firefighters are realizing it’s better to open up -- at least to each other. 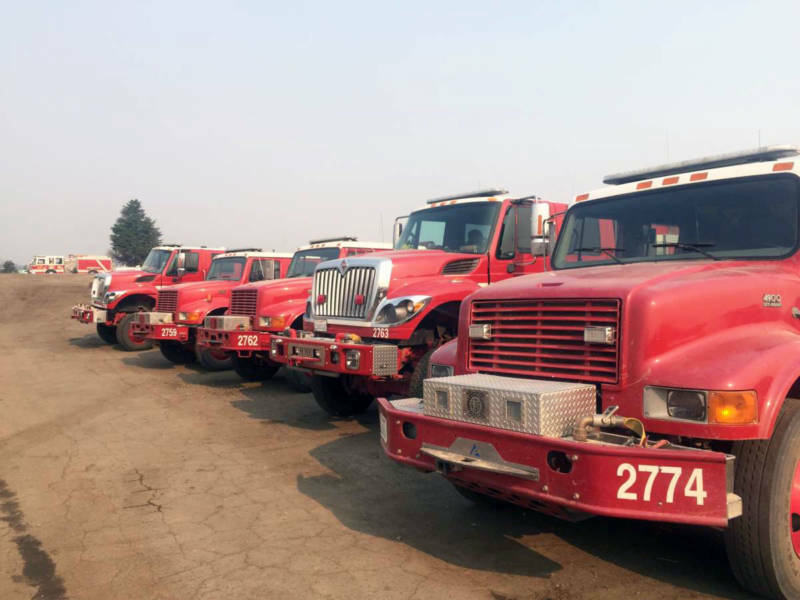 At the Mendocino Complex Fire base camp, dozens of massive engines are lined up ready to go. Leaning against one is Cal Fire Battalion Chief Rich Dennett. At first he’s really hesitant to talk to me, tries to give me a fake name. "I’m Norm Brown," he says. "That’s different than what’s on your name tag," I quip back. Dennett and some of his co-workers standing nearby chuckle. "All right, I’m Rich Dennett," he finally says as the laughter dies down. Dennett looks in many ways exactly like you’d expect a veteran firefighter to look. He's tall, in good shape and has a thick mustache with flecks of gray in it. He’s wearing a blue uniform topped with a dusty Cal Fire baseball hat. Dennett fits the bill of that guy you wouldn’t expect to open up about his feelings. But, "over the past 20, 30 years, we don’t bottle things up inside like we used to," Dennett says. "We’re more apt now to talk about those things, and I think it really helps." Dennett says there's still some truth to the perception that firefighters are stoic and don’t share their emotions. "To the public, it’s probably pretty accurate," he says. "But with each other, if there’s trying times or things that are difficult to handle sometimes with medical-type calls or other things, we’re really good about talking to each other and getting each other to open up. Sometimes it could be in the fire engine, sometimes it could be under the shade of a tree and just sit and talk." I ask him if there was a traumatic incident that he'd experienced on the job that he would be willing to talk about. "Nothing that I’m willing to share publicly," he says. There are still firefighters who aren’t comfortable showing emotional weakness to each other. Some see it as a stigma. Cal Fire has been trying to chip away at that. 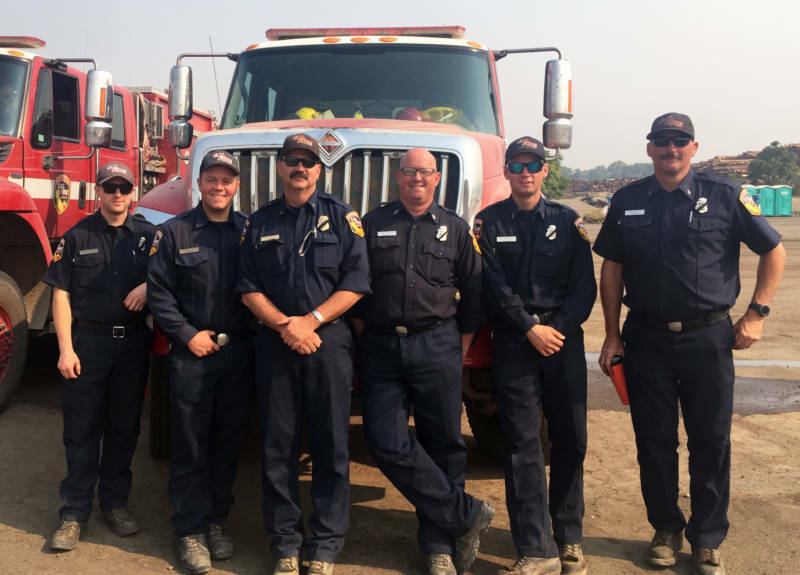 At a morning briefing last month at the Carr Fire base camp in Anderson, officials reminded the hundreds of firefighters gathered around the stage to take care of themselves emotionally. "Please take a moment today and tomorrow and every day just to check in with yourself and check in with your crews making sure you’re emotionally and psychologically available and ready to go rock and roll in what we’re doing out here. I just wanna let you know that we have a peer support trailer set up over here by check-in," the head of Employee Support Services said. 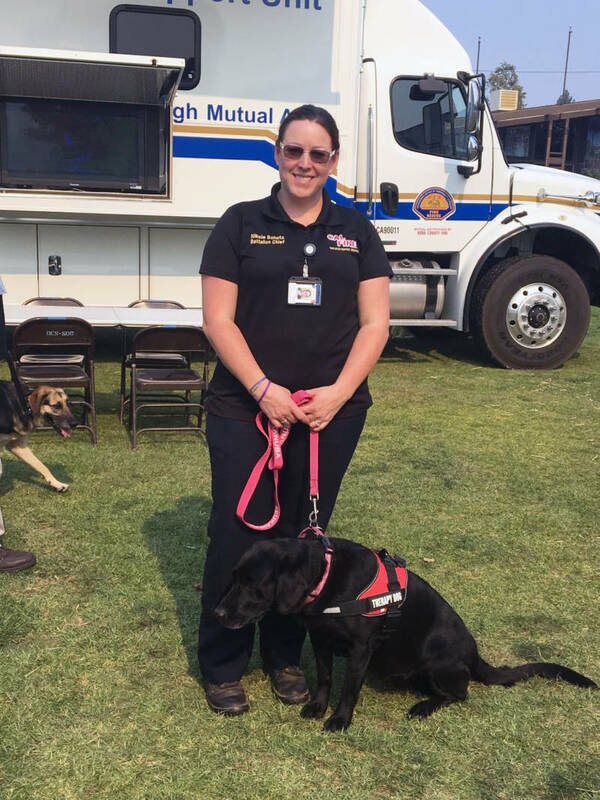 Down at the Mendocino Complex base camp in Ukiah, their air-conditioned peer counseling trailer sits slightly off the beaten path to protect firefighters’ privacy. It’s where peer counselor Nikole Schutz is stationed. She used to be a firefighter, too. 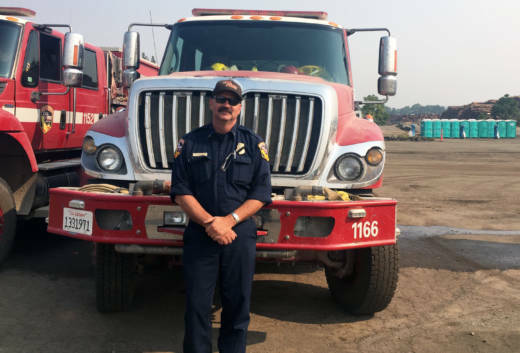 "When folks call and they do need help, there’s somebody on the line that understands what it’s like to be in the station, who understands what it’s like to be on the fire line," Schutz says. "It’s that credibility. On a big wildfire like the Mendocino Complex Fire, about 30 people drop by the trailer every day, Schutz says. About half of them will seek help from an outside therapist. "We tell them if your body says you need to cry a little bit, that’s fine, too," Schutz says. "So we just tell folks, you know, be human." Schutz says besides missing home and feeling fatigued, firefighters can witness some pretty traumatic things, especially on medical calls. "On our front there is a lot of post-traumatic stress out there. What we try to do as peer support is really educate people, so then they can catch it early," she says. This is helpful not just for an individual firefighter. It’s a larger safety issue. Because on the front lines of a fire, everyone needs to be laser-focused and looking out for each other. Cal Fire officials say they’re considering increasing their staffing to prevent some of the 48-hour shifts that become necessary at the outbreak of a large fire, as well as grant more vacation days for firefighters to recharge.